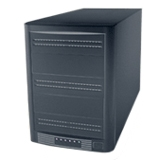 CRU-DataPort 4 Bay Storage Enclosure make it easy to attach an array of 68-pin SCSI, Ultra Wide external devices to any system with an available external SCSI channel. Directly attach non-removable hard drives, tape backup devices or CD/DVD drives to a server for backup, duplicating or additional storage. Will support most half height and full height SCSI tape backup units. Removable front bezels are included for devices that need external/front access such as tape backup units or CD-ROM drives. External SCSI ID selector switches allow you to set the SCSI ID number from the back of the enclosure and Power/drive activity LEDs are on the front.